Fascination Foreigner Ian, Entry 3! It’s hard to believe we’re already in the second half of 2014, time goes by way too fast. It’s also starting to get pretty summery again already! One of the great things about summer in Japan is kakigōri. The stuff you get in convenience stores is different from “fresh” kakigōri, but still delicious. 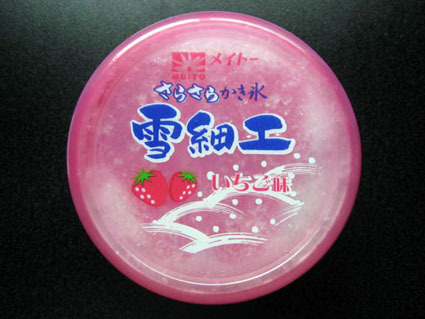 Kakigōri is fairly similar to snow cones, but with a lighter consistency and generally a different selection of flavors. One thing I find myself missing from the states is Slurpees/slushies; you can similar drinks here simply called “frozen”, but they’re relatively uncommon and definitely don’t have the flavor variety you see at an American 7/11. It’s a bit of a jump from that, but the theme for this entry is going to be “shopping”, starting off with a look at convenience stores! At first glance, Japanese convenience stores seem to generally be pretty similar to American ones, but on closer examination there are some distinctions that can be made. The biggest difference is the fact that, while in America convenience stores are most commonly attached to gas stations, in Japan there isn’t an association between them at all. 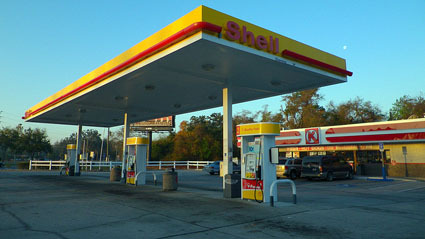 Highway rest stops/service areas will have gas stations as well as stores and restaurants, but aside from that I’ve never seen a joining of the two. It seems the most likely reason for this difference stems from transportation in America being almost completely car-centered, while in Japan trains are used a lot more commonly. Because a stop at a convenience store usually happens in the middle of a trip somewhere, or on the way home, it makes sense that their location would vary based on the popular transportation method! A Circle-K in America - Circle-K is a chain in Japan as well, just without the gas stations! That being said, the things sold at convenience stores are in general pretty similar. In both countries, you can get inexpensive, hot food at convenience stores, and in both countries it’s pretty widely agreed that it’s not very good for you. In addition, the fact of convenience stores being a lot more expensive than grocery stores doesn’t change here, but that’s the trade-off for “convenience”! Fortunately, we can also do our shopping at places a bit nicer than convenience stores: malls and shopping centers. In America and Japan, shopping districts and residential districts are definitely distinct areas. However, in Japan it’s not uncommon to see convenience stores, dry cleaners, and small restaurants even in the middle of residential areas. On top of that, because there’s not as much driving done in Japan, shopping areas tend to have lots of people walking around from shop to shop and shop owners actively promoting their goods to the street. In America, on the other hand, people tend to decide where they want to go shop and drive straight there, not paying as much attention to the other stores on the way. As far as malls are concerned, there’s one huge difference that immediately springs to mind: American malls are wide, Japanese malls are tall. One is pretty much the other, flipped on its side. Going to places like Aeon Malls or Daiba City, seeing the shop layout and food court definitely reminds me a lot of American malls. In America it’s pretty common to go to the mall to just hang out or window shop, but I’m not actually sure if that’s a thing here or not. 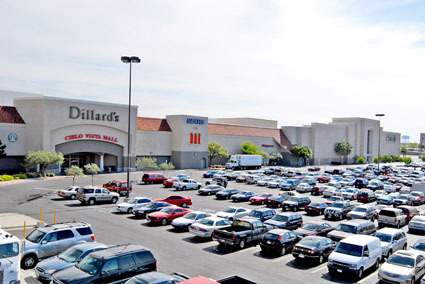 As mentioned before, since everyone travels by card in America one of the other things about malls there that you don’t see much in Japan is the huge parking lots. Last up, a little look at buying used goods! I’m definitely a fan of Book-Off, but even more than that I love going to Hard-Off. Just in general I find the idea of stores selling old electronics, including junk, pretty cool. Aside from entertainment media like movies and games, there are pretty much two kinds of secondhand stores in the states: pawn shops and thrift stores. Both are pretty similar to what are referred to as “recycle shops” here, and to each other part from their one main difference. 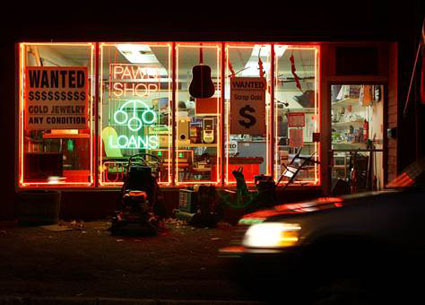 Pawn shops are a little closer to recycle shops, in that they buy used things from customers and then sell them back to other customers. In movies and the like, pawn shops are portrayed as being shady and sometimes selling stolen goods, but as far as I know there’s no reputation like that for recycle shops. Thrift stores, on the other hand, are usually for some kind of charity or benefit, so have a better image in that respect. The flip side of the coin is that they do get a bit of an unclean image, in terms of what they’re selling. Essentially though, pawn shops and thrift stores are pretty widely seen as “cheap”. It’s a bit off-topic, but one thing I noticed recently is that Japanese rental stores don’t seem to do video game rental at all. Instead, music CD rental seems to be extremely popular, which is practically unheard of in America (outside of libraries)! You’ll remember I mentioned the Aeon Mall shopping center chain in today’s entry, yeah? Well it turns out there’s actually a guy I know who DJs under the name “DJ Aeonmall”! He also uses the name “Numa Chikotsu” at times - I’ll let you look that one up yourselves. Other than the name he doesn’t have all that much to do with today’s theme, but he makes some great old school rave-inspired tunes so be sure to check him out!